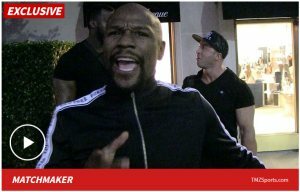 TMZ SPORTS -- sorry, fight fans ... Floyd Mayweather's making it clear -- the Manny Pacquiao tilt is off. "I don't give a f*** about what's going on with Pacquiao," Floyd tells TMZ Sports. Remember ... Floyd was singing a little different tune just a few weeks ago -- when he said, "I'm coming back to fight Manny Pacquiao this year another 9 figure pay day on the way." But, Floyd tells us that's now off, saying, "We not going to make that happen right now. Not right now. We must take that fight and let that fight build. And then, down the line, let that fight happen." Mayweather says it's kinda complicated ... but, basically, since Pacman's now signed with Floyd's manager, Al Haymon -- they wanna go a different route. "I think the best fight for Pacquiao -- what I told Al Haymon -- was probably the Adrien Broner fight. And then we got Errol Spence and Terence Crawford." In the meantime ... Floyd seems sure as hell set on getting in the ring with Khabib and/or Conor McGregor.